In 1893, Chicago was “a greedy, hog-slaughtering backwater.” Whereas New York had developed into a city of refinement and East coast “elites,” Chicago was still considered an undeveloped backwater filled with the country bumpkins and immigrant workers. Daniel Hudson Burnham (of Burnham & Root) was chosen to lead the construction of the fair and was given the rare opportunity to select architects from Chicago and around the country to participate in its design. He brought together many of the great architects of his time along with sculptor Augustus St. Gaudens and artist Francis Millet. He overcame tremendous physical, psychological and financial obstacles to complete the construction on time. History has shown the fair to have been a great success and a true testament to the sheer will and determination of one man, who was able to secure the civic pride that, ran so deep in Chicago and the rest of the country at the threshold of the 20th century. Below are some interesting facts from the fair. Enjoy! The Exposition lasted 6-months and drew over 27 million visitors, more than 40% of the United States’ population at the time. During its best day, it drew over 700,000 visitors. A new breakfast food was introduced called Shredded Wheat. Movies were introduced to mass audiences in a 1,500 seat theater in the “Streets of Cairo” exhibit. A single exhibit hall had enough interior volume to have housed the U.S. Capitol, the Great Pyramid, Winchester Cathedral, Madison Square Garden, and St. Paul’s Cathedral, all at the same time! The machine known as the “monstrosity” (the Ferris Wheel) became the fair’s emblem, a machine so huge and terrifying that it instantly eclipsed the tower of Alexandre Eiffel that had so wounded America’s pride. Never before had so many of history’s brightest lights been at one event, including Buffalo Bill, Theodore Dreiser, Susan B. Anthony, Jane Addams, Clarence Darrow, George Westinghouse, Thomas Edison, Henry Adams, Archduke Francis Ferdinand, Nikola Tesla, Ignace Paderewski, Philip Armour, and Marshall Field. Fire during construction killed 15 people. An assassin transformed the closing ceremony from what was to have been the century’s greatest celebration into a vast funeral. The country’s most infamous serial killer, H.H. Holmes, born in New Hampshire, used the exposition as a backdrop to kill an estimated 100 victims and was later arrested in Boston and eventually hanged for his crimes in Philadelphia in 1896. 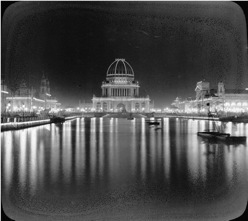 Designers of the World’s Fair were: Daniel Hudson Burnham, John Wellborn Root, George Post, M.B. Pickett, Henry Van Brunt, Francis Millet, Maitland Armstrong, Col. Edmund Rice, Augustus St. Gaudens, Henry Sargent Codman, George W. Maynard, Charles McKim, Ernest Graham, Dion Geraldine, Louis Sullivan, and Frederick Law Olmstead. New York Editor Charles Anderson Dana nicknamed Chicago “the Windy City” after the boastful leading men of the city, not the persistent southwesterly breeze. Designers of the first building in the country ever to be called a skyscraper: Chicago architectural firm Burnham & Root. $1,000 ($30,000 in today’s dollars): The consulting fee offered to Olmstead to participate in the design of the fair, which he turned down initially. He later accepted $26,000 fee for design ($670,000 in today’s dollars). Gas jets were still the primary source of illumination in the country. “Make no little plans; they have no magic to stir men’s blood,” noted Daniel Burnham. During the planning and building of the Exposition, Frederick Law Olmstead was in the middle of installing the landscape around the Vanderbilt Mansion in Asheville, North Carolina. The Eiffel Tower and the Paris World Fair of 1893 was the impetus for the grandeur and opulence of the White City. The fair was built in less than 26 months.